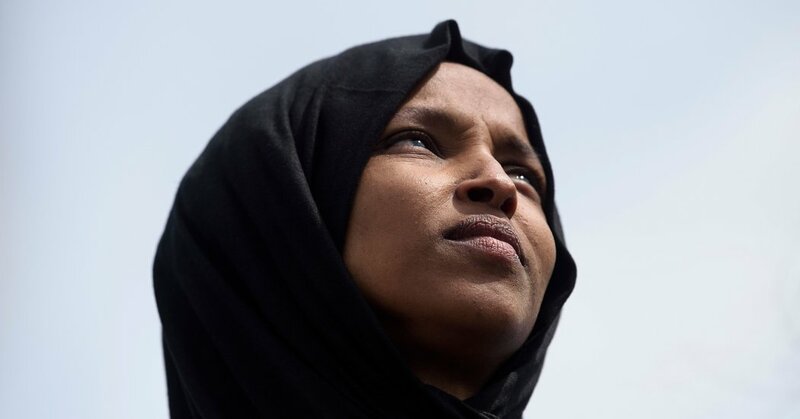 WASHINGTON — Speaker Nancy Pelosi asked House officials on Sunday to review security measures intended to protect Representative Ilhan Omar after President Trump tweeted a video attacking the Minnesota Democrat using images of the Sept. 11 terrorist attacks. Ms. Pelosi was not responding to new information about the safety of Ms. Omar, according to a senior Democratic aide. She called for the review based on dozens of threats made on Ms. Omar’s life before Mr. Trump posted the video on Friday, the aide said. After Ms. Pelosi released her statement, a spokesman for Ms. Omar, Jeremy Slevin, said, “Our office has seen an increase in direct threats on Rep. Omar’s life — many directly referencing the president’s video.” He said Ms. Omar’s office has collected a series of menacing tweets over the last few days, some accusing her of treason. The footage promoted by Mr. Trump intercut images of the World Trade Center aflame with comments from Ms. Omar, one of the first Muslim women elected to Congress, about the treatment of Muslims after Sept. 11. Conservatives have seized on those remarks as dismissive of the attacks. Sarah Huckabee Sanders, the White House press secretary, said Mr. Trump was not inciting violence against Ms. Omar, or Muslims in general, and would not be ashamed for “speaking out against” violence. She added that Democrats should be “taking the same hard line that the president is” against Ms. Omar. Ms. Omar, appearing at an event in Los Angeles last month sponsored by the Council on American-Islamic Relations, an advocacy organization, suggested that government officials infringed upon the free-speech rights of some Muslim Americans after the Sept. 11 attacks. “CAIR was founded after 9/11 because they recognized that some people did something and that all of us were starting to lose access to our civil liberties,” she said, making an incorrect reference to the organization’s founding, which actually took place in 1994. Ms. Pelosi, who is traveling in Europe during the congressional recess, has tried to contact Ms. Omar, but her travel schedule has made it hard for the two to connect, a Democratic aide said. The speaker criticized Mr. Trump in a series of early-morning tweets on Sunday from Germany, where she was visiting with United States service members. “It is wrong for the President, as Commander-in-Chief, to fan the flames to make anyone less safe,” she wrote. But the remarks have caught fire in conservative circles. The New York Post, owned by Trump ally Rupert Murdoch, juxtaposed Ms. Omar’s comments with a picture of the twin towers on its cover last week. On Friday, Mr. Trump followed suit. “WE WILL NEVER FORGET,” the president tweeted to his nearly 60 million followers, while posting the video that repeatedly played Ms. Omar’s reference to “some people,” then cut to the planes slamming into the Manhattan skyline. Ms. Omar has been the subject of numerous threats. Earlier this month, federal prosecutors charged a New York State man with phoning in a death threat to her. The attacks on the congresswoman have provided Democrats with a rare opportunity to unify around Ms. Omar, whose previous comments about Israel have been interpreted as anti-Semitic by some Jewish Democrats in Congress. After a fierce internal debate, Democrats passed a catchall anti-bigotry resolution last month that was intended, in part, to put the controversy over Ms. Omar’s remarks to rest. Ms. Pelosi joins a growing list of Democrats, including many of the declared 2020 candidates, who have denounced Mr. Trump’s tweet. On Saturday, Senator Elizabeth Warren, Democrat of Massachusetts, accused the president of “inciting violence against a sitting Congresswoman — and an entire group of Americans based on their religion” in a tweet. Senator Kamala Harris, Democrat of California, said Mr. Trump’s actions were another reminder of how important it was to unseat him in 2020.